Brewer's Hill Court features quality-built, contemporary, urban lifestyle homes in one of Baltimore's hippest neighborhoods. The "Smart Home" designed town homes are move-in ready and feature distinct floor plans, elegant brick facades and designer kitchens. Seaberry created a cohesive package of marketing collateral for this unique urban development. Our graphic designers selected a color palate in line with this contemporary, energy efficient, green community. 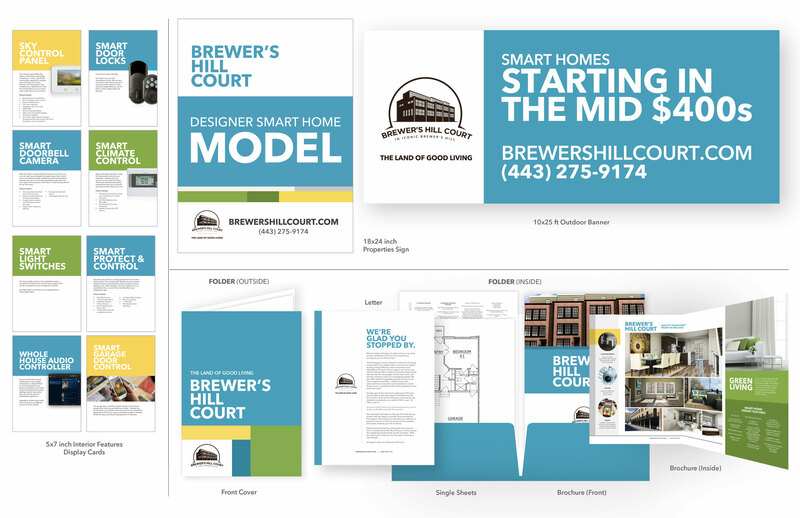 Marketing Collateral included an outside monument for the model home, interior signs highlighting smart home features, a welcome folder including letter and bifold brochure and a 10' x25' rooftop banner.